"Take every item and use it with every other item." If you choose the hint line option when you call the number for Videlectrix on Homestar's cell phone, another critique of the adventure game genre pops up. 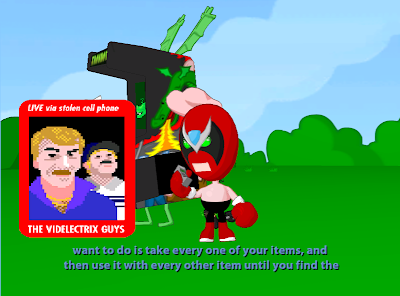 The Videlectrix guys tell Strong Bad to "take every one of your items, and then use it with every other item until you find the solution".